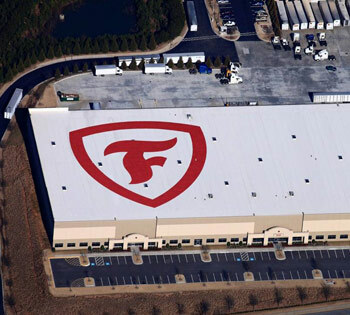 Firestone Building Products offers the most complete selection of low slope membranes in the industry with insulation and cover board for all Firestone roofing systems. This synthetic elastomeric membrane has been proving itself for over 40 years. Offered in both unreinforced and reinforced as a black membrane in traditional applications or unreinforced as a white membrane when a highly reflective surface is required, EPDM can be used in ballasted, fully adhered, mechanically attached, and protected membrane systems. Its weatherability and low-temperature flexibility make it the ideal choice for the most extreme climates. Platinum EPDM Systems can be warranted up to 30 years. Today's environmentally friendly choice when reflectivity is required for cooling savings as well as reducing the urban heat-island effect. Strong heat welded seams allow for quick installation in mechanically attached or fully adhered systems. Platinum 30-year warranties are available. An asphalt-based system that is produced in the factory using today's highly engineered polymer technology to enhance asphalt's natural waterproofing capability and either polyester or fiberglass reinforcement to improve its strength. Red Shield warranties are available for up to 25 years. The traditional roofing system proven by time. Firestone offers both Type IV and Type VI reinforcing felts as well as hybrid systems incorporating modified bitumen cap sheets. Red Shield warranties are available for up to 20 years. Firestone's ISO 95+ is a closed-cell fiberglass-faced polyisocyanurate insulation offered in both flat and tapered panels. ISO 95+ is manufactured in plants located across the United States and all meeting the rigorous ISO 9002 standard. ISO 95+ can be used in conjunction with any of Firestone's membrane or metal roofing systems. ISO 95+ passes the most stringent fire and wind uplift tests conducted by Factory Mutual Global, Underwriters Laboratories, and Miami-Dade County. ISO 95+ has the highest R-Value per inch of any commercial roof insulation. Lightweight and easy to cut makes ISO 95+ a contractor favorite. Its recycled content and energy savings ability help the building owner acquire LEED certification. Tapered ISO 95+ is used to achieve positive drainage in both retrofit and new construction applications. When used with Firestone roofing systems ISO 95+ is included in the total systems warranty. Tapered ISO 95+ provides an effective and economical solution where substrate slope will not permit efficient drainage. Clark Rheem & Associates provides a variety of technical support services for the installation of tapered insulation backed by the Firestone Tapered Engineering Design Department. Clark Rheem & Associates uses the latest technology to offer architects, consultants, general contractors, distributors and roofing contractors a complete, accurate and timely engineered tapered system. Firestone's Tapered Engineering Design Department is equipped with software that will handle or convert most digitally transmitted drawing formats as well as hard copy prints. Additionally, Clark Rheem & Associates offers architects and consultants a tapered design assist service. Through this service, Clark Rheem & Associates creates a professional and effective tapered system design for any project prior to bid. Clark Rheem & Associates can provide field estimating services including roof area takeoff and laser level deck elevation conclusions. Firestone total-system warranties assure complete wind protection from edge to edge. Every building is subject to wind-related roof damage and, all too often, shop-bent edges are installed that do not meet recognized industry standards, resulting in compromised performance. Firestone products are Factory Mutual-approved and have also been independently tested according to ANSI/SPRI ES-I Wind Design Guide. Details, color charts and samples are readily available for submittal and approval. Firestone Metal Products supplies quality coil and flat stock material in a variety of sizes and metals. Firestone facilities are strategically located throughout the country to support our customers' needs with quick and efficient service. Service centers inventory steel and aluminum in a variety of gauges and finishes. Natural metals, such as copper and zinc, are available to support high-end architectural applications. Standard colors and gauges can be found on firestonebpco.com. A variety of soffit panels comprise the Firestone Metal Products line. Most have the capability of being installed in both vertical or horizontal applications and come in a variety of materials and gauges. All soffit panels can be vented to provide air flow at the eaves of your building. For all of these products we offer design, specification and detail assistance. We also provide complete shop drawings before installation to assure it works and fits right the first time. We can assist in specifications, design, detail assistance, code compliance and choosing the right contractor. The SunWave Daylighting System is a premium daylighting product for the commercial roofing industry use for domes, smoke hatches and roof curbs that features a dome formation and unique high-performance frame design that increases visual comfort for people inside the building while conserving energy. The double-glazed SunWave dome formation consists of two prismatic acrylic layers, one clear and the other white. There are over 4,000 tiny prisms per sq. ft. (0.1 sq. m) embedded in each of the dome's two layers. The result is a soft, yet bright natural diffused light, that is distributed throughout the building, without the formation of "hot spots" or glare. The SunWave Daylighting System is available in six standard sizes and can be covered under a 20-year Firestone Red Shield™ Warranty for waterproofing and performance.